Sometimes a gal just has to finish off a chocolate bar for lunch, and that’s exactly what I did today. 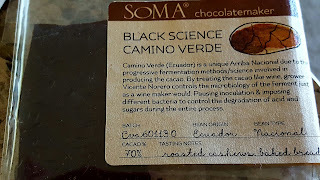 I had one piece left of this Black Science Camino Verde 70% Nacional from Ecuador bar, and I followed it up with a latte chaser. Now that’s my kind of a lunch! Special attention is paid to the fermentation process of this Nacional bean. Nose: Slightly herbaceous, a little floral, hot chocolate marshmallow smell. Taste: A tiny bit tannic, zero fruit, hint of balsamic vinegar, dark roast coffee. (Note: The first time I tasted this I got lots of bark notes, but now I really get the coffee coming through instead. I think it’s really important to try pieces of a bar on 3 different occasions to really get the whole picture). Finish: Medium length of finish with a touch of sweetness. 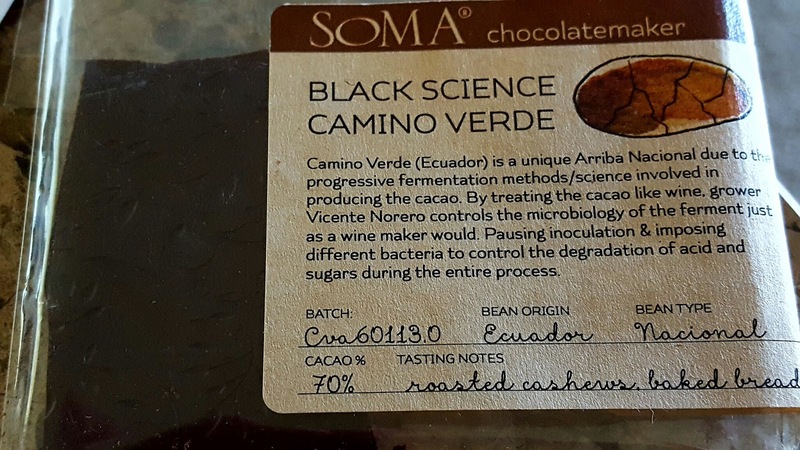 Since this bar has some coffee tasting notes it really works well with a latte, cup of medium/dark roast coffee, or a shot of espresso. Enjoy!